Proto Nuclear Polynesian: *Kiekie Freycenetia species (Pandanaceae). 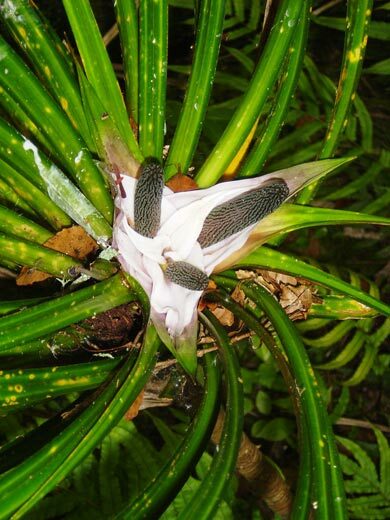 Kiekie, showing inflorescence/fruit with tāwhara. tēure, tīrori, pīrori, pātangatanga, all terms for the fruit of the kiekie (some at least probably dialect variants). Note: See the linked page highlighted at the top of this page for more information about the ancestral names, their modern descendents, and the plants they denote. 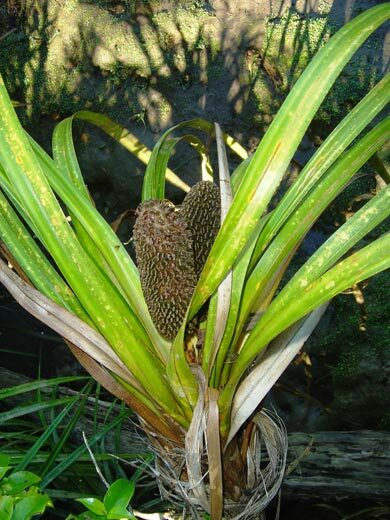 The kiekie is the sole representative of the Pandanus family in Aotearoa. It is a scrambling and climbing plant with slender leaves up to a metre and a half long, useful for weaving, aerial roots which furnished material for lashing and binding, and producing a highly esteemed edible summer-ripening fruit. Taku noho tonu nei ki te rau harakeke. He kai nui tonu māhau ko te rau o Huna. "Te rau o Huna -- the leaf of Huna" was the "leaf" of the tāwhara, the flower-bract of the kiekie, a delicious item of food obtained there. Kopu Erueti quotes the proverb about Hunā and Pāpakanui, which Pei Te Hurinui Jones translates as "Many dive in at Huna and many lie about at Papakanui". According to the notes to the poem, there was a lake at Huna where the kiekie grew (NM 221, note 16, pp. 134-5). which encapsulates two of the most desirable food resources. Meade and Grove comment in relation to another version of this whakatauakī (substituting uta "inland" for wā) that "these products of land and sea symbolise and abundance of food". Elsdon Best also notes that the Māori protected the edible parts of the kiekie from rats, which are indordinately fond of the tāwhara. This indeed is still the case, and probably accounts for the absence of any sign of the tāwhara around many ripening fruits one may encounter in the bush! Without bleaching and softening the kiekie could indeed be used for rough capes, and Alan Clarke in The Great Sacred Forest of Tāne says that the leaves were used for "course mats, belts, baskets, floor mats or sleeping mats, and hut panels" (p. 208). 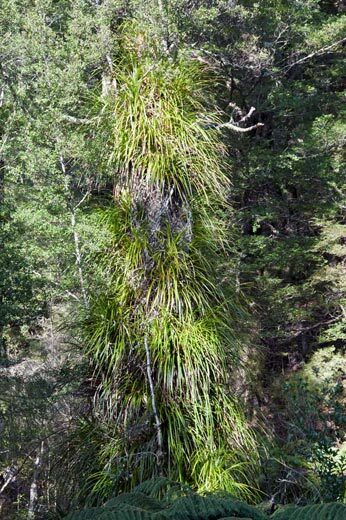 He notes also (p.204) that the split roots were used to bind pūtorino (a bugle-like musical instrument) made of fine-grained tanekaha wood, split, hollowed, and rejoined. However, Murdoch Riley points out (Herbal, p. 206) that in some places kiekie was a tapu plant and not used for food baskets or floor mats. 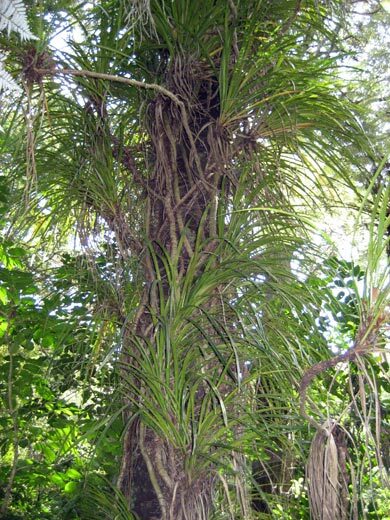 It was the preferred plant for use in tukutuku work, and the roots were made into fish traps and also sandals. According to research by Cheri van Schravendijk (see bibliography) the traditional method of harvesting kiekie leaves, wrenching them by hand, leaves considerably more biomass for regeneration and is much less destructive to the plant than more thorough harvesting using loppers. When growing on the water's edge, the plants produce unusual roots, several feet long and branching repeatedly, with spongy or corky whitish rings. (See Moore and Edgar, Flora Vol. 2, p.98.) However, the kiekie is essentially a forest-dweller, and according to tradition fled to the forest while its erstwhile companion the harakeke (flax) took refuge in the water during a struggle between Tāne and Tangaroa -- there is a brief summary of this story on the page for aka (the generic name for vines). References and further reading: There is further information about the kiekie on the NZPCA web site, and also in a Landcare (Manaaki Whenua) research information sheet, as well as in the sources quoted above and other works on the NZ Flora (including a highly informative thesis on the kiekie by Cheri Johanna van Schravendijk -- see the bibliography for publication details). Photographs: The picture of the kiekie on a kohekohe tree (Dysoxylum spectabile) is by "Kahuroa", on the German Wikipedia website. The others are by Wayne Bennett and Jeremy Rolfe of the NZ Plant Conservation Network. Maidstone Park, Upper Hutt. Photo: (c) Jeremy Rolfe, NZPCN.